Do not ride with the seatback reclined so that the shoulder belt is no longer resting against your chest. In a collision you could slide under the seat belt and be seriously or even fatally injured. Use the recliner only when the vehicle is parked. Push the lever upward on the seatback to tilt the entire seat forward. 3. Slowly flip the entire seat forward. 4. Secure the seat with the strap. Wrap strap around sport bar, and put one end of the strap through loop of the other end. Pull to tighten strap around sport bar. Place the opposite loop around hook of seat. Route the strap so that it is between the plates of the seat to eliminate slack and increase tension, as shown. using a seat belt properly. 5. When completed, return seat to it’s normal position. out and away from lower bracket. 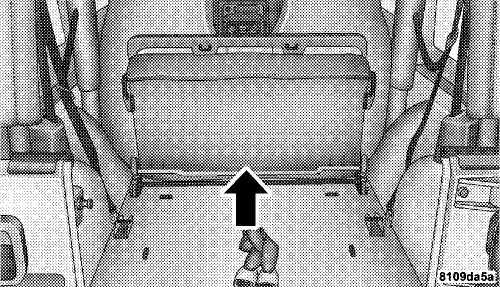 Remove seat from the vehicle. Reverse steps for removing the seat. Be certain to pull the seat belts between the seat cushion and seatback. Position them for passenger use. in seats and use seat belts. To open hood, first release both hood latches. Next, locate handle in middle of the front end of the hood. Insert hand into gap between hood and radiator support and lift up on handle to raise hood. You may have to push down slightly on hood before lifting up on handle. 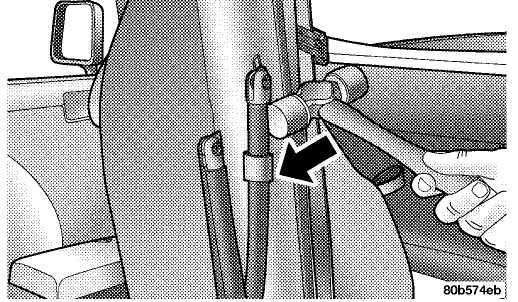 Insert the support rod into the slot in the radiator support. To close the hood, remove the support rod from the radiator support and place it in the retaining clip. Lower the hood slowly, then let it drop the last few inches. Secure both of the hood latches. 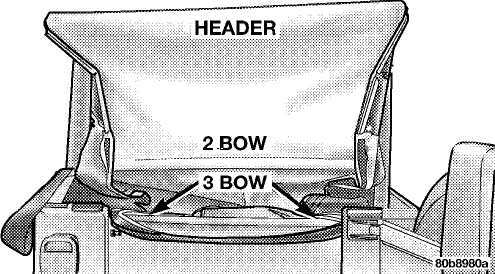 If the hood is not fully latched, it could fly up when the vehicle is moving and block your forward vision. Be sure all hood latches are latched fully before driving. The overhead light comes on when a door is opened. It may also be turned on by rotating the control for the dimmer switch on the muti-function control lever fully upward. The overhead light will automatically turn off in about 20 minutes if a door is left open or the dimmer control is left in the dome light position. Turn the ignition switch ON to restore the overhead light operation. Certain instrument panel components (odometer, radio display) can be illuminated at full brightness during the daytime. This can be helpful when driving with your headlights on during the daytime such as in a parade or a funeral procession. To activate this feature, rotate the left stalk one detent lower than the dome light. The multi-function control lever controls the operation of the parking lights, headlights, headlight beam selection, passing light, fog lights, instrument panel light dimming, and turn signals. Turn the end of the multi-function control lever to the first detent for parking lights and instrument panel lights. Turn to the second detent for headlight operation. 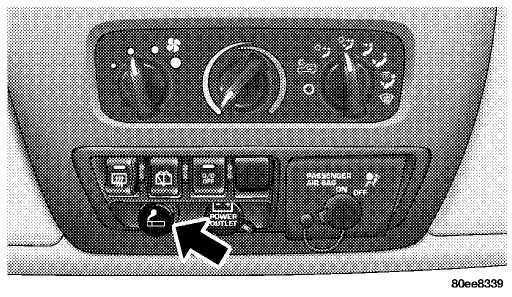 To change the brightness of the instrument panel lights, rotate the center portion of the muti-function control lever up or down. NOTE: If the driver’s door is left open, and the head­lights or parking lights are left on, the "High Beam Indicator Light" will flash and a chime will sound. If the headlights or parking lights are on after the ignition is turned off, a chime will sound when the driver’s door is opened. Pull the multi-function control lever towards you to switch the headlights to HIGH beam. Pull the muti-function control lever a second time to switch the head­lights to LOW beam. You can signal another vehicle with your headlights by lightly pulling the multi-function control lever toward the steering wheel. This will cause the headlights to turn on at high beam and remain on until the lever is released. 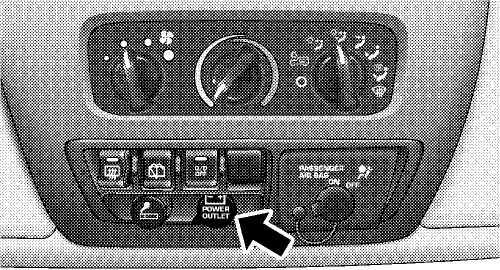 The front fog light switch is in the multi-function control lever. To activate the front fog lights, turn on the parking or low beam headlights and pull out the end of the lever. NOTE: The fog lights will only operate with the park­ing lights or the headlights on low beam. Selecting high beam headlights will turn off the fog lights. Move the multi-function control lever up or down and the arrows on each side of the instrument cluster flash to show proper operation of the front and rear turn signal lights. You can signal a lane change by moving the lever partially up or down without moving beyond the detent. If either light remains on and does not flash, or there is a very fast flash rate, check for a defective outside light bulb. If an indicator fails to light when the lever is moved, it would suggest that the fuse or indicator bulb is defective. NOTE: A tone will chime if the turn signals are left on for more than 1 mile (2 km). The headlights come on at a low intensity level after the vehicle has been driven approximately 3 feet (1 meter). They will turn off when the vehicle is turned off or when the headlights are switched on. In cold weather, always turn off the wiper switch and allow the wipers to return to the park position before turning off the engine. If the wiper switch is left on and the wipers freeze to the windshield, damage to the wiper motor may occur when the vehicle is restarted. of the lever. The delay can be regulated from a maximum of approximately 18 seconds between cycles, to a cycle every second. 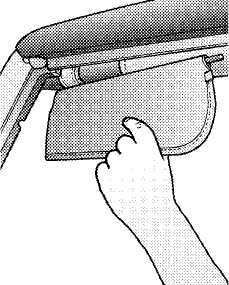 To use the washer, pull the lever toward you and hold while spray is desired. If the lever is pulled while in the delay range, the wiper will operate for two wipe cycles after the lever is released, and then resume the intermit­tent interval previously selected. 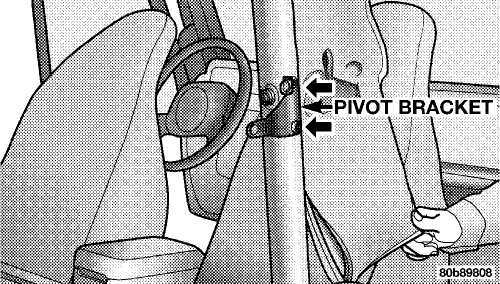 If the lever is pulled while in the OFF position, the wipers will operate for as long as the lever is held plus two wipe cycles, then turn OFF. 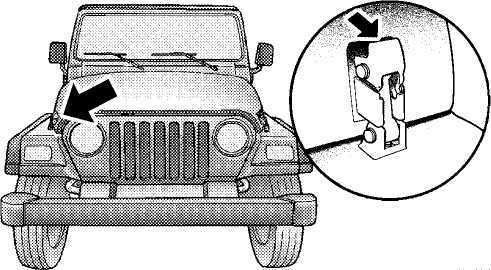 Push down on the wiper lever to activate a single wipe to clear off road mist or spray from a passing vehicle. As long as the lever is held down, the wipers will continue to operate. 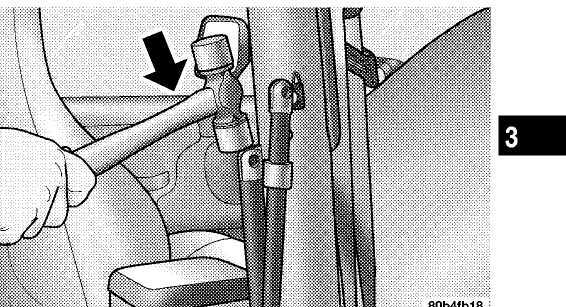 To tilt the column, push down on the lever below the turn signal control and move the wheel up or down, as desired. Pull the lever back upwards to lock the column firmly in place. 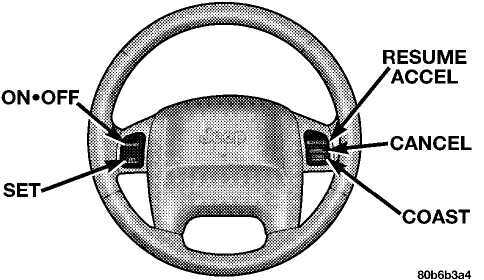 Tilting the steering column while the vehicle is moving is dangerous. Without a stable steering col­umn, you could lose control of the vehicle and have an accident. Adjust the column only while the ve­hicle is stopped. Be sure it is locked before driving. When engaged, this device takes over accelerator opera­tions at speeds greater than 35 mph (60 km/h). 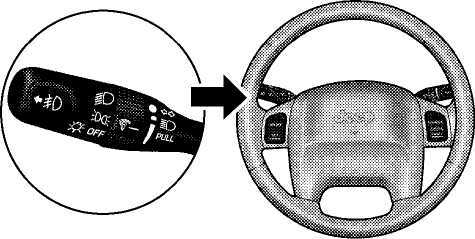 The controls are mounted on the steering wheel and consist of ON-OFF, SET, RESUME/ACCEL, CANCEL, and COAST controls. Press and release the ON-OFF button to turn the system on. To turn the system off, press the ON-OFF button again. The system should be turned off when not in use. The CRUISE indicator light in the instrument cluster illuminates when the system is on. When the vehicle has reached the desired speed, press and release the SET button. Release the accelerator and the vehicle will operate at the selected speed. 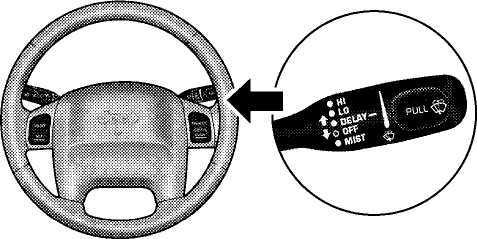 A soft tap on the brake pedal, normal braking, or pressing the CANCEL button will deactivate the Speed Control without erasing the memory. Pressing the ON-OFF but­ton or turning off the ignition erases the memory. To resume a previously set speed, press and release the RESUME/ACCEL button. Resume can be used at any speed above 30 mph (50 km/h). When the Speed Control is on and set, speed can be increased by pressing and holding the RESUME/ACCEL button. When the button is released, a new set speed will be established. Tapping the RESUME/ACCEL button once will result in a 2 mph (3 km/h) speed increase. Each time the button is tapped, speed increases, so tapping the button three times will increase speed by 6 mph (9 km/h), etc. To decrease speed while speed control is on and set, press and hold the COAST button. Release the button when the desired speed is reached, and the new speed will be set. Depress the accelerator as you would normally. 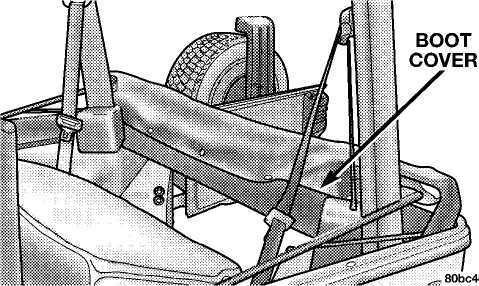 When the pedal is released, the vehicle will return to the set speed. NOTE: When driving uphill, at elevations above 2,000 ft. (610 meters), or when the vehicle is heavily loaded (especially when towing) the vehicle may slow below the SET speed. (If the vehicle speed drops below 30 mph (48 km/h), the Speed Control will automatically disengage). If this happens, you can push down on the accelerator pedal to maintain the desired speed. Leaving the Speed Control on when not in use is dangerous. You could accidentally set the system or cause it to go faster than you want. You could lose control and have an accident. Always turn the system off when you are not using it. The vehicle may be equipped with a cigar lighter recep­tacle, element, and ashtray (Smoker’s Package Only). 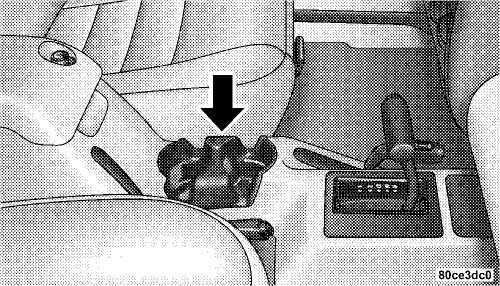 The cigar lighter will be located in the lower instrument panel (near the heater controls), and the removable ashtray will be located in the center console. To the right of the cigar lighter (if equipped) is the 12 volt power outlet. The outlet is connected directly to the battery, items plugged into this outlet may discharge the battery and/or prevent engine starting. The outlet in­cludes a tethered cap labeled with a battery symbol indicating the power source. mittently and with greater caution. alternator to recharge the vehicle’s battery. 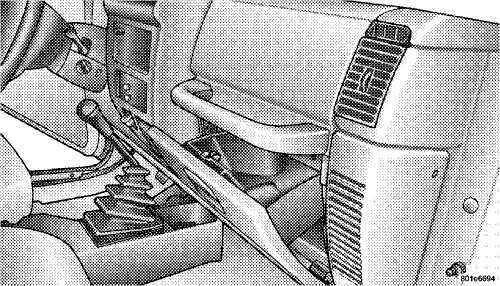 In the center console there are two cup holders for the center console, front seat passengers. NOTE: The cup holder insert is removable from the console, for cleaning. To unlock the glove compartment, insert the key and turn. To open, pull the latch up. To unlock, insert key and turn. To open, press the latch button. The factory-installed Add-A-Trunk™ option provides a secured compartment for parcels or equipment when the tailgate is closed and locked. 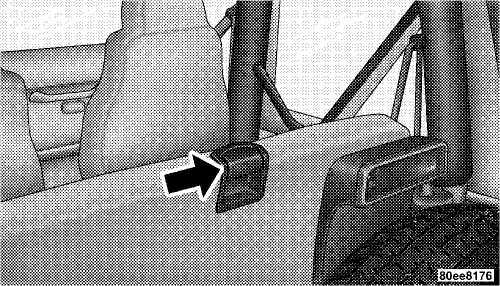 To gain access to this compartment, simply open the tailgate and release the spring loaded latch pins. The cover of the Add-A-Trunk™ can then be raised. 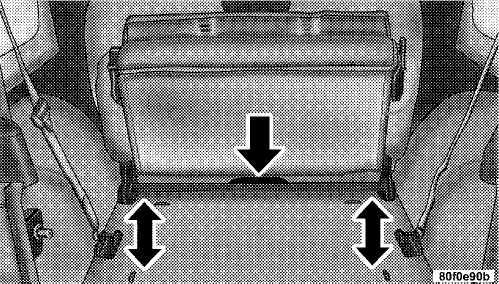 When the Add-A-Trunk™ is not desired, it can be easily removed from the rear compartment. Remove the four knobs that secure the "trunk" to the body. Lift the Add-A-Trunk™ out and place the knobs in the molded-in storage area. Storage space is also provided for the wheel lock, and lock key tool. 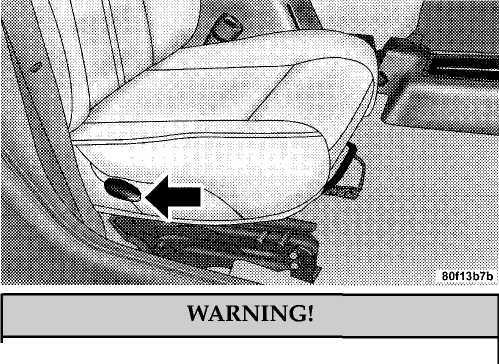 Do not leave the Add-A-Trunk™ loose in your vehicle. Remove it and store it in a safe place. If your vehicle is equipped with a Dual Top, you must remove one of the tops from the vehicle. The soft top was installed at the factory for shipping purposes only. The soft top and the hard top are to be used indepen­dently. Removal is mandatory to prevent any possible wear and tear on the soft top, should both tops remain on the vehicle at the same time. Failure to do so may void your soft top warranty. screws (2 per side) using a #30 Torx® head driver. 4. Using a rubber mallet, carefully tap the knuckles from the outside edge. This will remove the bow assembly from the pivot bracket. Remove the soft top from the vehicle and store in a clean, dry location. 5. Unzip the zipper on the sport bar cover to expose the pivot bracket. Remove the brackets using a #T40 Torx® head driver. Recover and re-zip the sports bar cover. Store pivot brackets and screws in a safe place. 6. Reinstall the hard top. 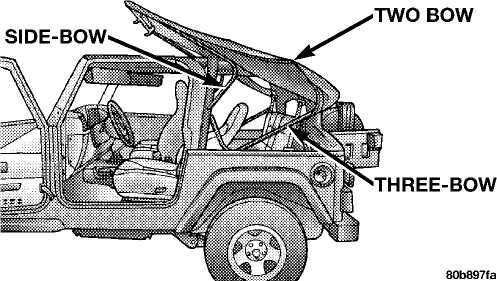 Refer to "Hard Top Installation" in this section. NOTE: The following procedures are for first time set up only. 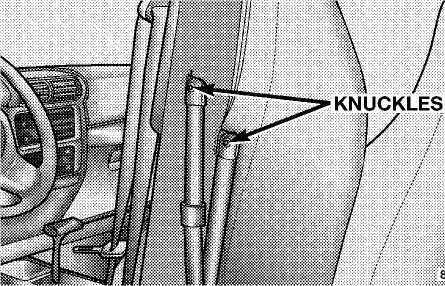 For future soft top procedures, refer to "Soft Top" in this section. them (refer to "Door Frame" in this section). curved portion of the bows facing upward. to reattach them to the pivot bracket. Do not overtighten the screws. 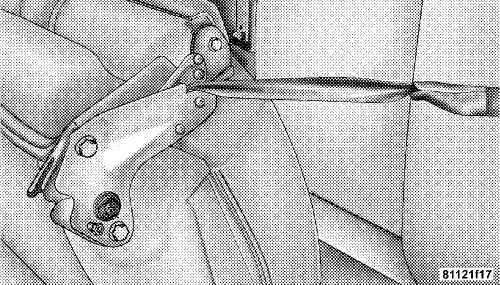 You can strip the screws if they are overtightened. 5. Unsnap and remove the black boot cover. This cover should be discarded. It was intended as a protective cover for shipping only. NOTE: A visual instruction sheet is enclosed in the dual top wrap. is located in the soft top and set aside. NOTE: Be sure the wire harness is not attached to the soft top bows before you lift the top. vehicle and wrap around the plastic header. header so that the fabric has a tight, smooth appearance. up and over the sport bar. 12. Move to the side of the vehicle and pull the side bow 13. Unclip and move the sun visor to the side, forward and down. You will see the 3 bow rise from the rear of the vehicle.